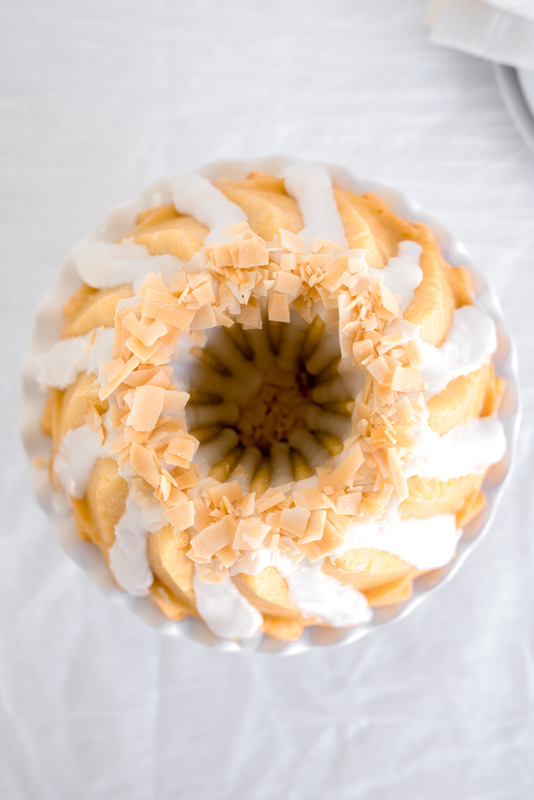 This triple coconut bundt cake is perfect for the coconut lover. Coconut in the cake, soaking syrup and glaze and topped with more coconut. A tropical vacation in a cake! Cake recipe from Beautiful Bundts by Julie Anne Hession. Flu season is no joke. 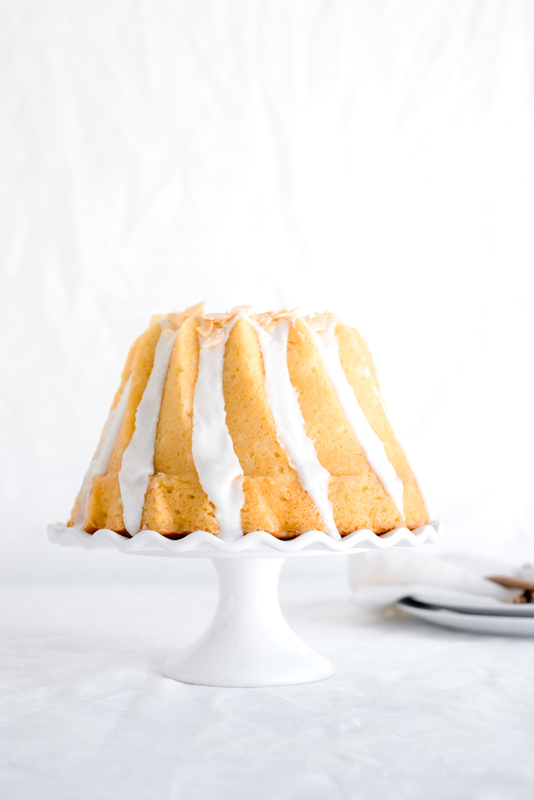 I was planning on blogging this triple coconut bundt cake recipe and giveaway before Christmas. But with getting a cold, then my kids winter break from school, and me getting the flu at the last week of their break and FINALLY feeling better now three weeks later, I am finally posting it. So I apologize for being somewhat MIA here, and I have some posts and giveaways I had planned for Christmas coming up. Maybe they will be Valentine’s giveaways? 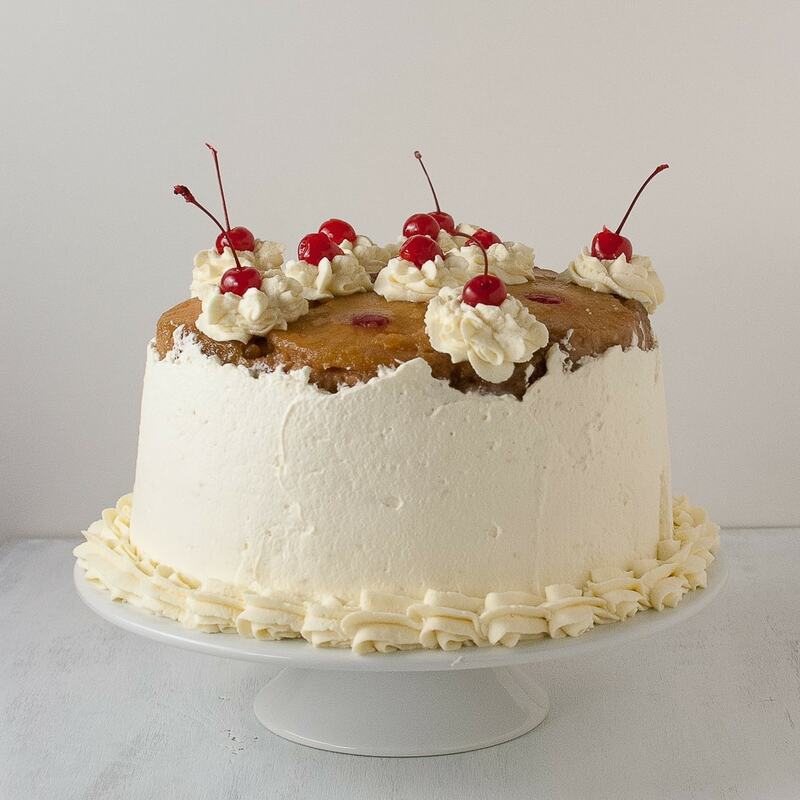 Either way, giveaways to come and we will start with this post for this lucious triple coconut cake. 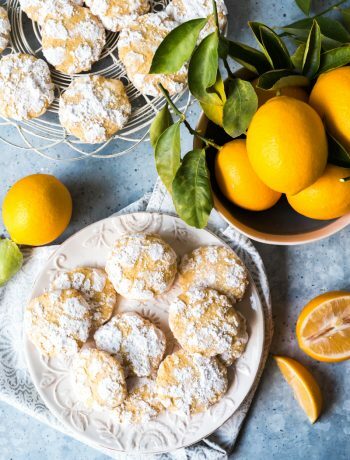 I have some amazingly talented friends in the food blog world and when one publishes a cookbook or baking book I am always excited to get my hands on a copy to make their recipes and giveaway a copy of the book. Julie is a local Las Vegas food blogger who, besides writing baking books ( she already has published a book on cookie decorating and hand pies), is a very successful competitive cook and baker. She has won many cook-offs locally and on Food Network. She spends part of her time in Jackson Hole Wyoming with her husband and young daughter. It’s a nice place to go to get away from the extreme heat of Las Vegas summer. She is one of the nicest people I have met in the food blog world, glad to be able to call her a friend. I loved seeing her many amazing bundt cakes she was posting on Instagram last year, knowing she was soon to come out with a new book. Her blog is Peanut Butter and Julie. 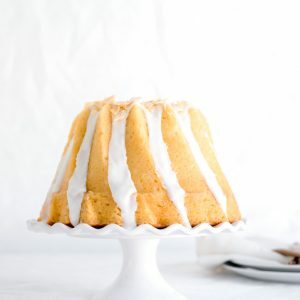 I had my eye on Julie’s Triple Coconut Bundt Cake to make first and I had just ordered a new bundt pan in the mail, so I waited until the pan arrived before I made it. I looked through the book to see what I would want to make while I was waiting for my pan arrived and I landed on the Lemon Lover’s Bundt. I had just picked some gorgeous and huge Meyer lemons from my tree so I knew I had to make this bundt. When I first made this cake I hadn’t originally planned on photographing it since the bundt cake I wanted to make for my blog was the triple coconut bundt cake. But I had some lovely light shining onto my new kitchen table so I took a few snaps. You know when you get that thick slice of iced lemon bread at a coffee pastry shop and its sweet and tart all at the same time and oh so good? That is this cake but better. Like, a million times better. 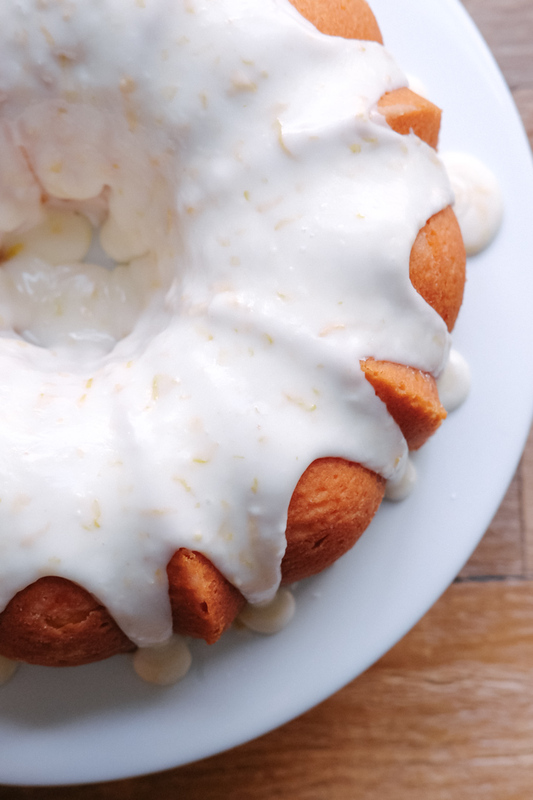 The use of lemon juice, and zest in both the cake and the icing is genius. 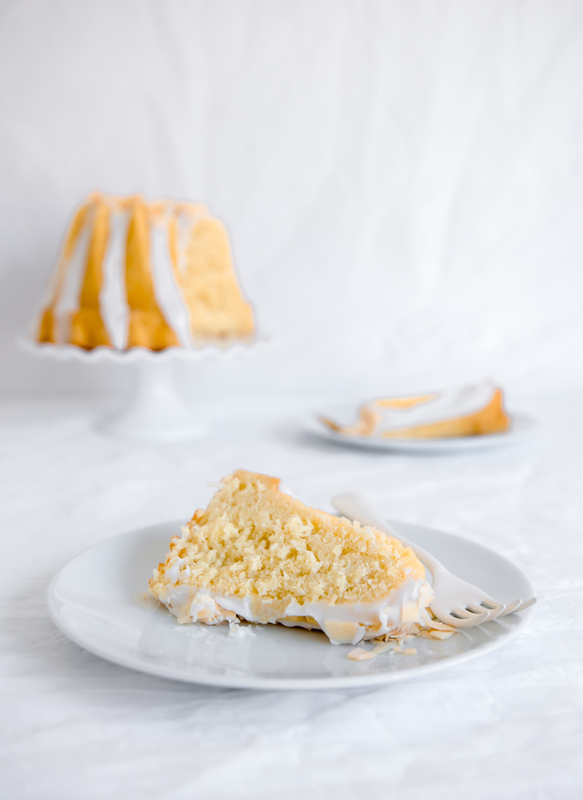 I love seeing the little flecks of zest in the icing, and this cake is so perfectly moist and dense and oh so lemony. 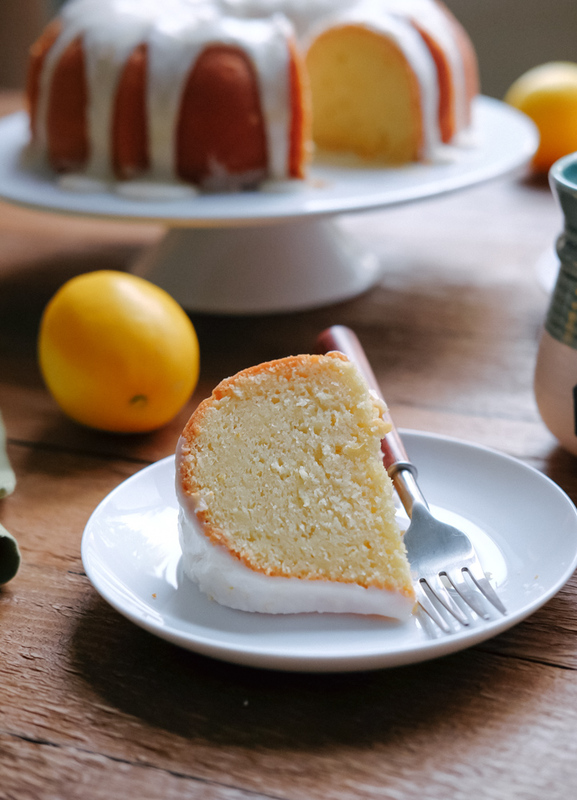 One of the best parts about this lemon cake is you can cut bigger slices than you get when buying at a coffee shop! And all of its lemony goodness. I had a few sweets in my house already, since Christmas time was coming up, I gave almost half of this cake to a neighbor. They loved it so much they asked me to make them another! 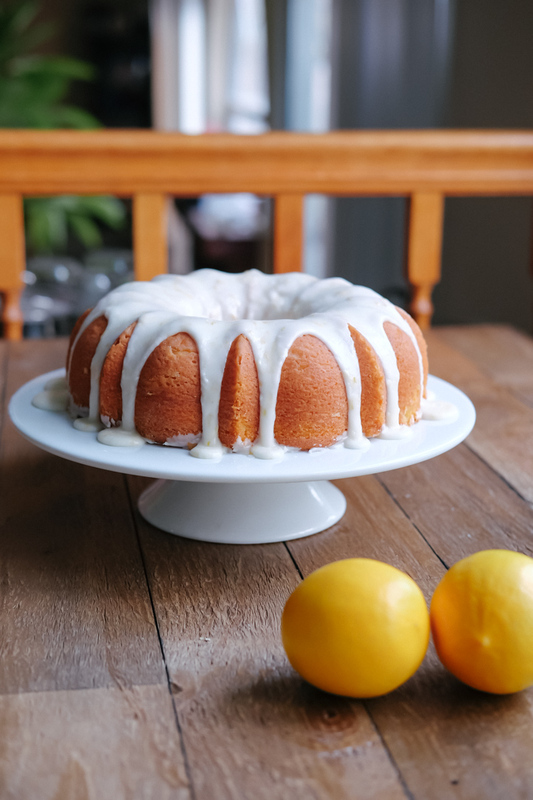 My tree is still bursting with giant Meyer lemons so I think I will be making a few more lemon lover’s bundt cakes soon. And I definitely will be making the triple coconut bundt cake again soon too! 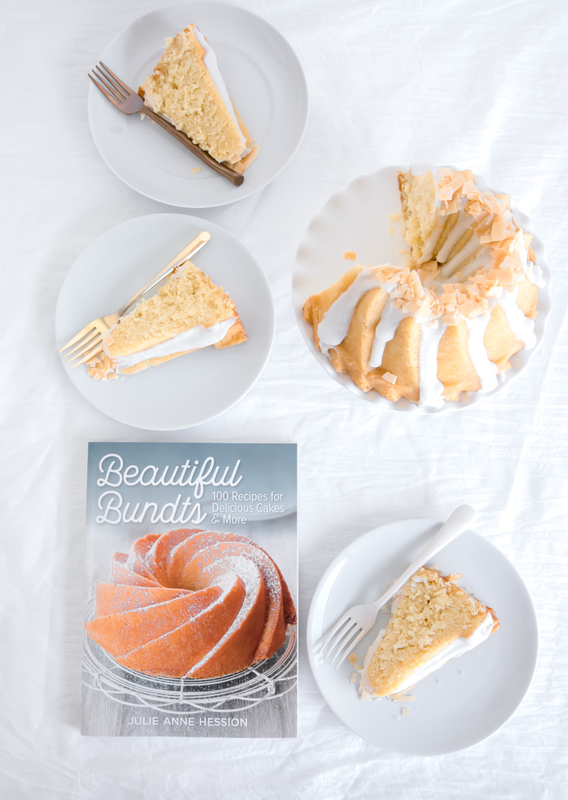 Julie’s book, Beautiful Bundts, has just about every kind of bundt you can think of. From sweet to savory, fruit only, retro and even mini bundts! The beginning of the books has lots of tips and tricks for bundt success. There is information on equipment you will need, techniques for different kinds of bundts, and the types of ingredients that work best for bundt cakes. It is a very thorough book with gorgeous photos to go along with the recipes. I am giving away a copy of Beautiful Bundts to one lucky reader. AND as a bonus I am adding in a bundt pan too. The Party Bundt to be exact. Here is the Lemon Lover’s Bundt made in the Party Bundt pan. This is one bundt pan I do not have yet. I love it, the shape is perfect for a glaze to run down between the edges, plus the name alone is just fun. Recipe for the Triple Coconut Cake first, Entry form for the giveaway right below it! With mixer on low speed, slowly add egg mixture to the butter mixture, stopping to scrape down sides of bowl as necessary, until fully incorporated. Beat for one minute. With mixer still on low speed, alternate the flour and buttermilk, making three additions of flour and two of buttermilk. Beat until fully incorporated. Beat in sweetened toasted coconut. Pour batter into prepared bundt pan and smooth the top. Bake in preheated oven for 45-60 minutes or until puffed, and golden and tester inserted into the middle comes out clean. Let cool in pan while preparing soaking syrup. Combine the sugar and coconut milk in a small microwave safe bowl. Heat on high in 15 second increments, stirring between each until sugar is dissolved. To make the glaze whisk the glaze ingredients together until smooth. When cool, pour coconut glaze over the cake, letting it drip down the sides. 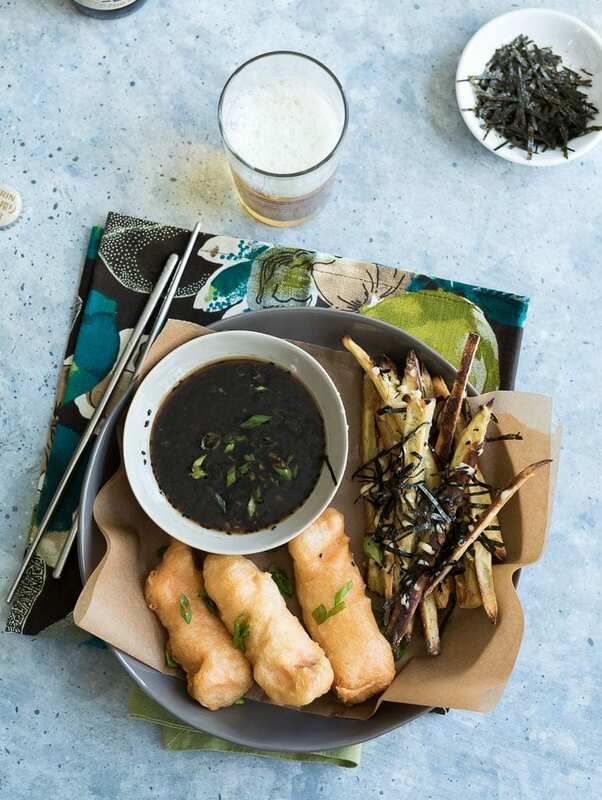 Garnish with toasted large flake coconut and let stand to allow the glaze to set before serving. If you don’t have butter with tablespoon markings, measure 3/4 C plus 2 Tbsp to equal 14 Tbsp. To toast coconut - spread in an even layer on a baking sheet and bake at 300 Deg F (150 C) stirring occasionally for about 8-10 minutes until toasted. Watch carefully as coconut can burn very quickly. Now time for the giveaway. ONE person will win a copy of Beautiful Bundts by Julie Anne Hession and a Party Bundt Pan by Nordic Ware. Fill out the form below, tell your friends, and good luck!!! My favorite cake is lemon, which might have something to do with the Meyer Lemon tree in my backyard. How can you not love those lemons. I LOVE that party bundt pan! Will definitely have to try this cake, it sounds delicious!! The lemon looks amazing. I love anything lemon. Love fruit flavored cakes, especially bunts which aren’t fussy and barely need icing to enhance! this looks so good! I love lemon cakes!!! 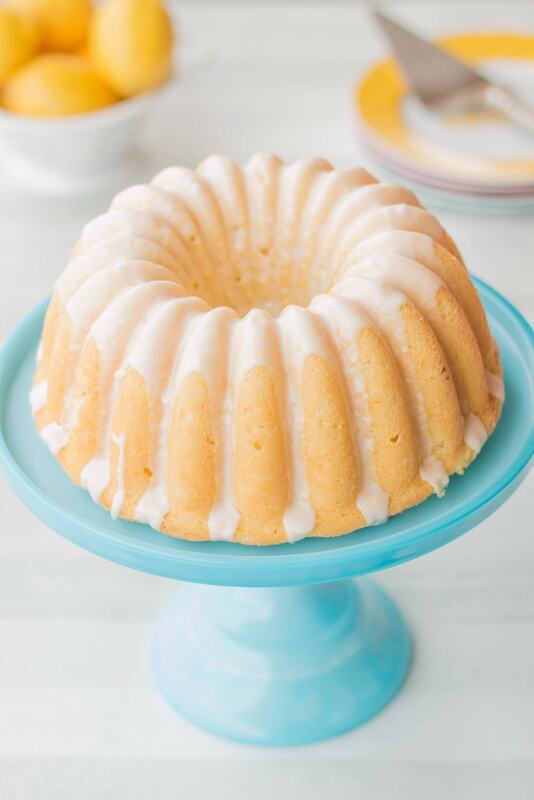 I can’t wait to make this bundt cake…it looks delicious! My favorite cake is German chocolate, which may have more to do with the icing than the actual cake!! A local bakery used to make a chocolate cake with whipped cream frosting. I used to ask for it for my birthday every year. Sadly, they closed their doors for good about 10 years ago. My favorite cake is dark chocolate, but I love all things coconut too. I can’t wait to make this yummy cake when I get the 2 ingredients that I need. I love bundt cakes! My favorite cake is either angel food cake or butter cake. Hawaiian paradise cake. Mmmmm, so good! That looks good! I love Bundt cakes. Can’t wait to make this. I adore everything lemon! There is a spiced cranberry bundt cake that I make every winter that is also a favorite. The tangy cranberries burst open while baking leaving a bit of cranberry jam in every bite that is laced with winter spice, sublime. M y 2 top favorite cakes are Lemon cake and Coconut cake!! I do a pineapple upside down cake in a bundt pan that is delicious and very pretty. That has become my new favorite.